Those who work as professional horse jockey in the world of thoroughbred racing say it takes a lot of skill, hard work and dedication. There are also many health risks involved, which go far beyond injuries from falling off a horse during a race. Many of the jockeys are forced to restrict their diets, so they do not weigh more than the extremely low (and dangerous) weight limits. 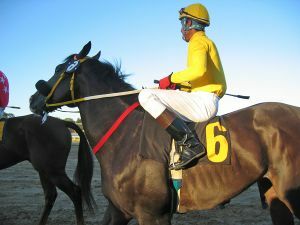 This phenomenon was covered in an HBO documentary titled, “Jockey.” The competition to ride the top horses in the world means there is little room for any physical issues with riders, and even a minor injury normally means the end of a jockey’s career. Gary Stevens was at one time one of the best riders in the sport. However, once his knee damage became too severe, he was forced to retire. Fortunately, he was able to undergo a total knee replacement and was able to get back out on the track and actually finished second in the Kentucky Derby riding Firing Line. According to a recent article from The Courier Journal, riding in the Kentucky Derby with a total knee replacement was practically unimaginable prior to Stevens’ latest race. During an interview for this story, Stevens discusses how a knee injury surely meant retirement for a jockey, but that is no longer the case. He says his new artificial knee is as strong as his knee prior to the injury and was specifically designed to withstand an intense athletic workout, which is necessary to race a thoroughbred horse. Our Boston knee replacement injury lawyers wish Mr. Stevens continued success in his recovery and horse racing career, and also wish him the best of luck in the Preakness and Belmont Stakes as the Triple Crown season progresses. However, we also know that not everyone is fortunate with his or her own total knee replacement procedure. The reason for this is because we have seen many cases where medical device manufacturers try to cut corners and avoid necessary safety testing, so they can push a product to market faster in hopes of making profit. When they do this, they are putting profit ahead of patient safety, and that is not acceptable. First, it should be noted, a defective knee replacement case typically does not involve any error on behalf of the orthopedic surgeon. While there are obviously some cases involving medical malpractice, it does not matter how experienced or professional the surgeon is if he or he she is unknowingly implanting a defectively designed knee or using a defectively designed surgical cutting, as we have seen with the OtisMed cutting, and OtisKnee system. In that particular instance, not only did manufacturers hide problems from the United States Food and Drug Administration (FDA), they actually knowingly shipped defective knee replacement products after FDA had rejected an application for approval. In that case, an official with the artificial knee device manufacturer was actually sentenced to time in prison as a result of his not only reckless, but also illegal, actions involving a defective artificial knee product.